In my refrigerator is a jar full of curried turnips. I was given the recipe on a day of cool easy perfection by the woman who runs Gratitude Gardens. Turnips are capable vegetables. Most people don’t know what to do with them. They are purchased, turned over, stared at, occasionally boiled then likely pondered some more. What I have found is that this particular vegetable can turn its self over to any flavor it greets. It takes on the scent of parsley and rosemary then sizzles well diced up and fried as hash browns. It soaks up the juices of coconut milk leaving you with no option but to douse it in golden curry powder. It mashes beautifully mixed with heavy innocent butter and a bit of thyme. 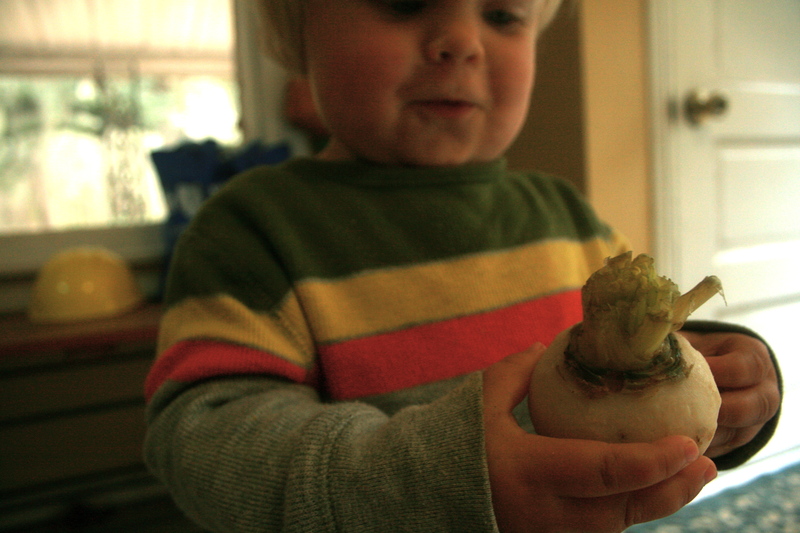 Surely at any given point there is something lurking in your refrigerator that would accompany turnips with grace. They are versatile. They are malleable. They are unpredictable. Much like this household I would think. One minute the world is serene with the misty morning air, the next I am yelling at my child in front of five children and two adults for head butting me in the mouth. I begged my hands not to retaliate as I held my lip and tasted blood seeping on to my tongue. Thankfully they obeyed. The entirety of the playdate consisted of good cop bad cop between me and the overwhelmed three-year old. Oh, the tension was palpable I am sure. I am glad for good friends with understanding sympathy, for this morning was trying. I am now eating cold curried turnips, perfectly fork tender, choosing to focus on the crisp clear morning air that surrounded me as I was told the instructions on how to make such a treat all the while remembering that this too shall pass and an easier day will come again. Likely, following a much-needed nap. For all. In a large stock pot of salted boiling water plunge whole turnips with the skin on until they are just tender enough to plunge a fork into with ease. You will know when they are done because you will not have to put forth much effort to do this, but do it well before they crumble due to the puncture wounds. Strain and place into an ice bath. The skins will be loose enough to rub away. This way you will not loose any precious meat by peeling before hand. Halve, quarter and halve again each turnip. Place them in a sauce pan filled with coconut milk and 3 tablespoons of yellow curry powder. Stew at a low temperature until supper. Or however long your taste buds please. How do you deal with play dates gone awry? And more importantly how do you prefer your turnips? This entry was posted in around the house, food and tagged curry, gratitude gardens, play dates, three year old, turnips. Bookmark the permalink. I love your writing style and voice. You are a wonderful momma! And don’t ever, ever question that. I just may have to give turnips another try. OH, and your tip on my wilted kale worked wonderfully! It’s looking very happy and healthy. You just did some fabulous pr for turnips, they never sounded so good! You are such a positive mama to be around–thanks for the inspiration!